Want a larger version? You got it. I don’t have a really good explanation for this. 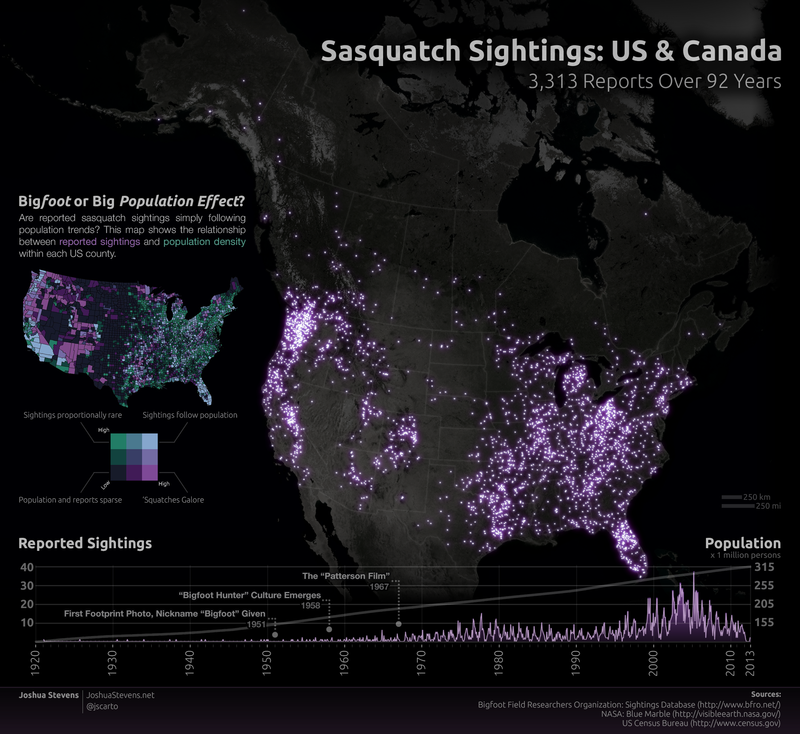 These are sasquatch sightings we’re talking about and I’m way out of my area of expertise (do bigfoot experts exist?). But it’s clear that if the legendary biped is real, it’s thriving out west. The terrain and habitat likely play a major role in the distribution of reports (note: reports, not sasquatch themselves!). Even if bigfoot wasn’t lurking nearby, it might be hard to tell when surrounded by rugged terrain and dense forest. Was that a stick cracking naturally or is a giant primate creeping around? The desire to find, or think you saw, bigfoot might be especially high if you’ve heard tales of giant, ape-like creatures calling the place you’re in home. A combination of environment and legend likely combine to at least put wary outdoorsmen on the lookout. These environmental factors could be explored with a dasymetric map that accounts for the habitat and separates the wilderness from suburbia. Furthermore, the population data are based on the US Census, which is based on where people live. The places we live, and the places we spend the other 50% of our time (at work, traveling, camping, vacationing, etc) are very different. We don’t have data for that, unfortunately. There’s also inherently some bias in the report data. Being a US-based website, it is dominated by US reports, and the reporting mechanism is not precise: if coordinates are not known (would you really log a GPS reading while staring ‘squatch in the eye?! ), the BFRO site only allows reporters to enter the nearest city. This could be many miles away. Ultimately, I’m not convinced there’s a descendant of Gigantopithecus playing hide and seek in the Pacific Northwest. But if respectable folks like Survivorman Les Stroud and primatologist Jane Goodall believe there’s something more to the myth, I think it’s at least worth putting on the map.